Video conferencing solutions for business enable you to meet face-to-face with a client, colleague or other contact no matter where you are in the world. The implications for increased productivity, efficiency and cost-saving are obvious: you can schedule in a meeting with anyone, anywhere, at any time without the limitations of geography, meeting room and accommodation costs, and transport expenses. You can also ease your conscience a little with the knowledge that this form of communications significantly reduces your carbon footprint, as well as giving you a competitive edge. We offer industry leading, integrated Avaya Scopia and Mitel conferencing solutions, a must for businesses engaging in frequent long distance meetings. Our solutions offer sharper image and sound quality, so you get a truly immersive, realistic experience when engaging and collaborating. The Scopia® Desktop and Mobile software from Avaya brings the benefit of video conferencing to all your staff. It allows you to meet with colleagues, partners, and customers, regardless of location, and join any meeting easily from your desktop or mobile device. The desktop software, available for both PC and Mac, can be used in a virtual meeting room or on individual desktop machines. The mobile software runs on iPhone, iPad, and Android phones and tablets. While conferencing you can share and annotate documents, spreadsheets, and other online content. A unified interface across all platforms means moving from desktop to mobile is a seamless experience. Meetings can be controlled, moderated, and administered right from within the Scopia® application. Licencing complexity is kept to a minimum with freely distributed software clients. An award-winning set of features allows staff to access the intuitive and easy to use software. It is easy to install, and can support any BYOD (Bring your Own Device) working model you have in place. Security is built-in and allows encrypted meetings, meaning that your collaboration is completely secure. 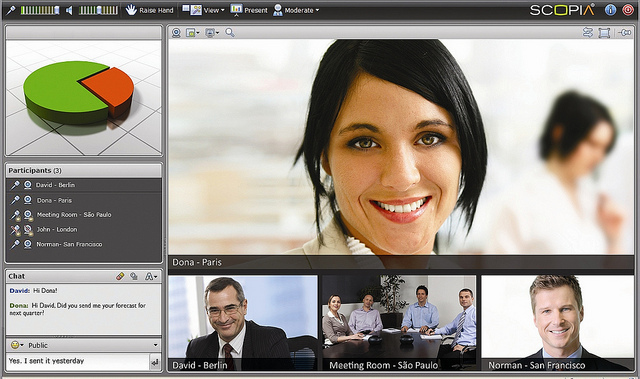 Video Conferencing is easy to adopt, easy to use and offers a high-quality experience for all participants involved. The solutions we provide work on a single-click conference entry basis, meaning there is no complicated log-in procedure prior to starting the meeting. Users can partake in desktop sharing, where a participant can view what you can view on a computer without having to exit the video conference at all- especially useful when it comes to meetings dependent on visual information such as diagrams, charts, images or slideshows. With Business video conferencing also possible via handheld device, Mac or PC, and supported by Android and IOS, this means that anyone in your organisation working on a BYOD basis will be able to take part in a conference using their own device easily. Finally, with the Avaya Scopia conferencing system it is possible to catch up on any meetings missed using the Content Slider application, which allows you to view previous slides from a meeting or even during the presentation. Our customer care team at Solution IP provide ongoing support and training for all our integrated video solutions, to enable you to get the full benefit from your system, including access to the latest training manuals and reference guides for all our solutions. SOLUTION IP are business communications specialists. What are schools upgrading from ISDN to build better disaster recovery? What do SMEs consider when switching from ISDN to VoIP?